Alternative Health & Healing Arts Festival, annual event at Seaforth Community Centre in Seaforth, NS. 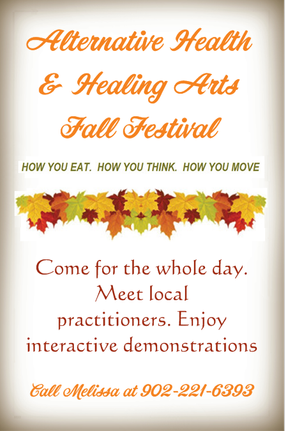 The Alternative Health & Healing Arts Fall Festival is an annual event held at Seaforth Community Centre in Seaforth, Nova Scotia. The intention of the Festival is to bring awareness of the various healing modalities available in integrative health and to offer healthier options in food, skincare and household products. Practitioners offer interactive demonstrations, talks and private sessions, leaving visitors with an enlightened view of the world of healthy holistic lifestyles.